Latest version of main document available at: http://www.clarity.net/~adam/tire-changing-doc.html. Copyright © 2000-2009 Adam Glass. All rights reserved. Distribution or publication of this document (electronic or otherwise) is prohibited without the express written consent of the author. For more information or to request permission to publish this document, please contact the author at clarity.net@adam. The information contained in this document is provided at no cost and without any warranty whatsoever. Improperly installed motorcycle tires can lead to serious injury and death, as tire problems can cause unpredictable, unavoidable accidents. The author is not responsible for any errors contained herein, and make no claims whatsoever as to the safety, validity, or veracity of the information contained in this document. Any work you choose to do on your motorcycle is done so at your own risk. If you do not know what you're doing, take your motorcycle to a reputable shop with skilled professional mechanics. The information contained in this document is provided for entertainment purposes only, and is not intended as advice on how to service a motorcycle. The instructions contained on this page merely document how the author changes his tires. Any use of the information contained in this document is done solely at your own risk. Reading beyond this point constitutes an implicit acceptance of these terms and conditions. STOP ... if you haven't read the main tire-changing document, start there! Loosen the rim lock and push it into the tire. The rim lock will look sort of like another valve stem (or two -- sometimes there are multiple rim locks), except that, of course, it won't be hollow like a valve stem. Remove the nut and washer(s), and push the rim lock into the wheel. Good news ... unlike the tubeless tires, you don't need to apply a massive amount of force to unseat the bead. Once you've let the air out and released the rim lock, you should be able to start right in with the tire irons. 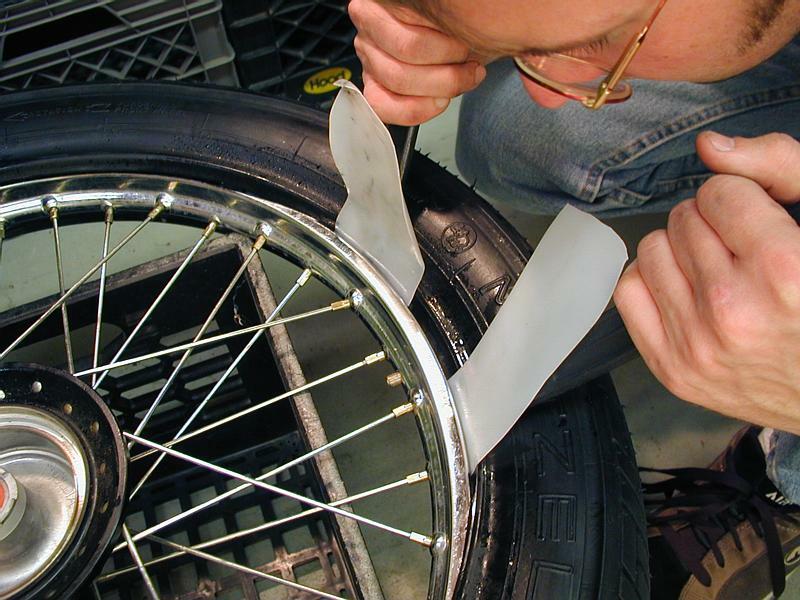 Using a tire iron and a rim protector, and starting reasonably far away from the rim lock, insert the tire iron into the gap between the bead and the rim. Pry the bead over the rim, but be very careful not to pry on the tube inside -- only insert the tire iron the minimum necessary to get it to hold the bead. Pry the bead over the rim in another location a few inches around the rim (but, again, not near the rim lock). At this point you should be able to pull the rest of the bead off by hand, but if the tire is really tight it may be necessary to pry the bead off in a third location with a tire iron. Once you get the top side of the bead off, carefully pull the tube from the tire, guiding it between the metal rim and the tire's bead with your fingers. Be gentle with the valve stem. It shouldn't take irons (but it's OK if it does) ... remove the tire the rest of the way from the rim. You may need to guide the bottom side's bead past the rim lock, or maybe there's enough space for the rim lock to bounce around and not be in the way. Never force things. Once the tire's off you can remove the rim lock (which sometimes gets stuck/hides in the tire.) 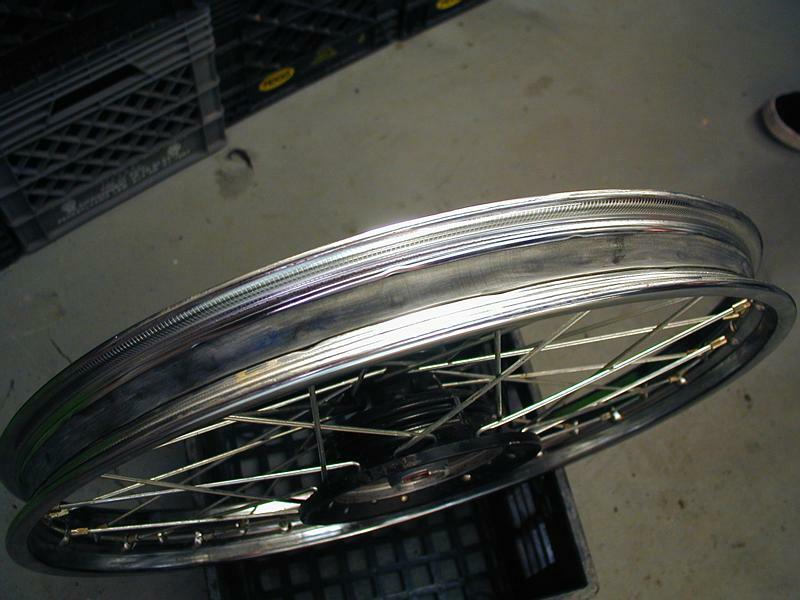 And you can remove the rim strip, which covers the ends of the spokes and prevents them from abrading the tube. Wipe these down and clean everything up, particularly the inside of the wheel. You don't want sand or dirt or sharp things in here damaging the tube. Mounting a tube tire can be kind of tricky, since there are typically a bunch of things that all need to be installed in order. Essentially you do all the steps above backwards, but it can be confusing, so let's walk through it. The rim lock goes on first. Slide it in through its hole, and put the washer(s) and nut back on the threads, but don't tighten it down yet. Put the rim strip on, paying careful attention to where the valve stem hole goes. Make sure it's centered and covering all of the spoke ends. Being careful to clear the rim lock, put the bottom half of the tire on. You may or may not need irons for this, but it's OK if you do. Put 1 or 2 psi of air pressure into the tube, so it has some form but isn't rigid. This will help you avoid puncturing it when you lever the top bead over the rim. Guide the tube into place inside the tire, making sure the valve stem is aligned with the hole in the rim strip and the rim itself. Push the valve stem through the hole and screw down the nut that holds the valve stem in place, but leave it loose for now. 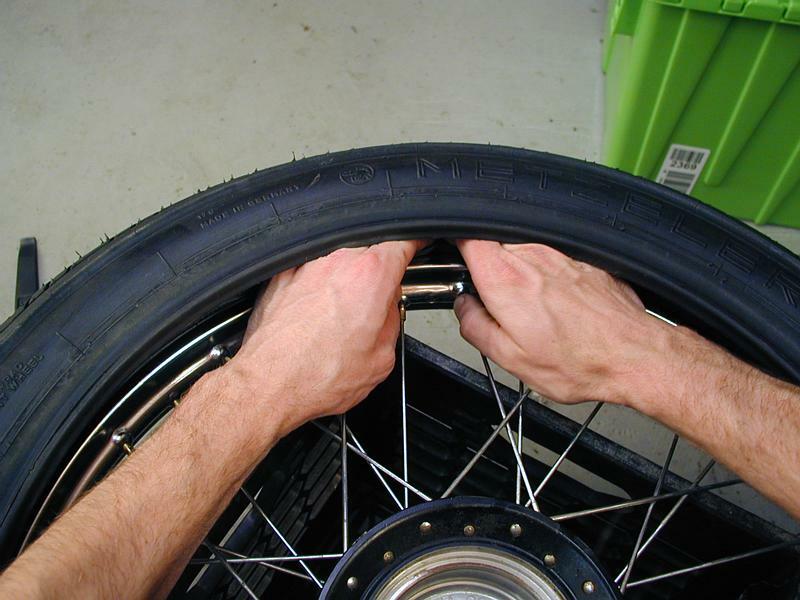 Starting opposite the valve stem, use rim protectors and tire irons to lever the top side of the bead over the rim. Alternate back and forth, and watch the valve stem to make sure it isn't twisting one way or the other -- you don't want it to have any force on it. 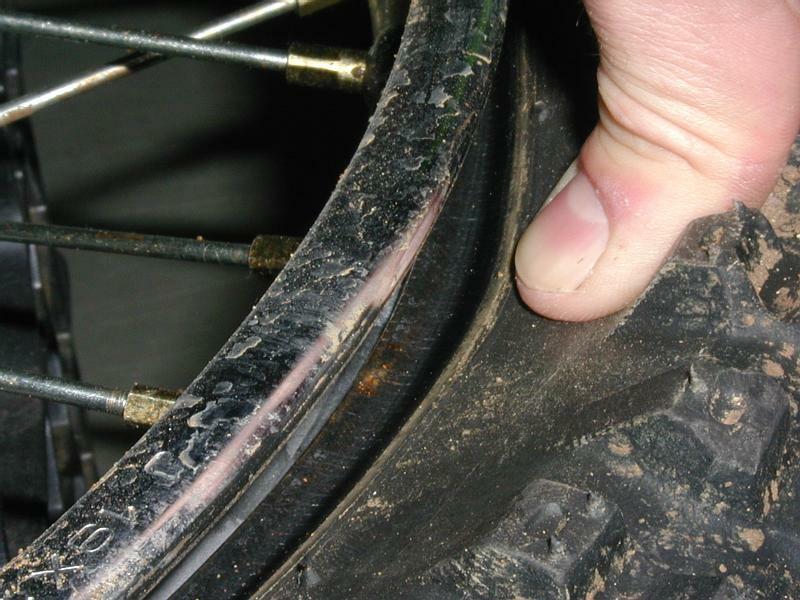 As with removal, be extremely careful not to pinch the tube between the rim and the tire iron. Go slowly, make frequent inspections, and try pushing down on the sidewalls to make sure that the tube is far away from the action. Before you put air in the tube, make sure the tire isn't pinching the tube anywhere. You might find that it helps to push down on the sidewalls to push the tube into the inside of the tire. Push the rim lock in a bit and guide the bead underneath it -- it has to hold the tire from slipping, or the valve stem could be ripped off. Give both sides of the tire a close inspection to make sure that the tube isn't pinched and that both beads are where they should be, and ready to be locked down by the rim lock. Inflate the tube to the pressure you want to run it at. You're done ... unless you "pinched" (punctured) the tube, in which case you'll hear air rushing out of the tube (or it just won't hold air) ... you'll need to need to take everything apart, patch the tube, wait for the patch to dry, and be more careful next time to make sure that the tube is never pinched between tire irons and rims, beads and rims, etc. Tighten the rim lock down to the rim. Don't ask me what a good torque value is; your service manual should have that info. Also, don't forget to tighten down the valve stem nut, and reinstall the valve stem cap. Check the sidewall and wheel rim to make sure everything looks good and consistent all the way around. If you're in doubt, take things apart and re-do them, or take them to a pro for advice/assistance. Balancing a tube tire is exactly like balancing a tubeless tire, but rim locks may throw off the balance a fair amount, so prepare to add a bunch of weight. Dirt bike tires don't need to be balanced, but any street bike with tube tires should definitely get its wheels balanced. Refer back to the main document for help balancing tires. Spoked wheels need to be trued from time to time ... if you know how to do it, you can measure the runout as described in the main document, and adjust the spokes as necessary. Even if you don't know how to true the wheels, you can spin the wheel and let the spokes bounce off a screwdriver to see if any of them sounds different. Different-sounding spokes are probably too loose or too tight.